They are words a football loving Dad hopes he will never hear; "I don't want to go the football with Daddy anymore." In fact I didn't hear it directly. I was working away when my wife texted me to say our son had been a bit upset and uttered those words. I knew they had been coming for a while. I knew that he didn't really enjoy going to the match. The restlessness, the questions about his surroundings rather than what was happening on the pitch, the distant stare away from the on-pitch action, lost in day-dreams of happier things. He had found it hard to tell anyone. He didn't want to upset me and he liked the fact that football meant that he spends time with me. I was left in mixed emotions. The fact he goes to football to make me happy made me smile and want to cry at the same time. We explored his concerns and a litany of complaints followed. Most of his concerns can be allayed and his worries and fears can all be pinpointed to a dislike of the anger and aggression he sees at football. A lot of this concern arises because he is a sensitive and emotional lad and an incident at Wembley in 2011 when mindless thugs, purporting to be Stoke 'fans' attacked the stationary car my wife and son were sitting in on their way up to the Wembley car parks. Banging on the windows, shouting leering, goading, ripping window flags down and rocking the car. He was 6 and very scared, as was my wife. When they subsequently parked up they were again confronted by a beer-fuelled aggressor, invading their personal space and abusing them for not supporting his team. Rare events maybe, but once they have happened they are engrained, especially at such an age where perceptions are quickly formed and opinions are even harder to retract. "What do the spectators get out of it?" "The players get paid even when they don't win. But when they win, what do the fans get?" The main problem is that he doesn't enjoy football, either watching or playing. Although he says he supports United and Bolton (he often lists the Wanderers first, more to wind me up), he doesn't really have an attachment to them, they are more "my dad's team" or "my mum's team", not "My team". It is an easy joke to make that if he is going to follow United he should get used to being bored and not enjoying it. In fact, it is hard enough watching your team struggle as an adult, never mind as when you are 6, 7 or 8, going along to out of duty as your Dad hopes beyond hope that you may develop that strength of affiliation and bond that he developed with his team when he was your age. If I have been bored numerous times in the last few seasons, how must he have felt? Cold, fed-up, wishing he was elsewhere, wishing his dad would let him play on his phone or his DS. He has gone along to football training, but both times it wasn't a great experience. I first took him along to our local junior team; indoor training with their nursery side, all about learning skills with a game thrown in at the end. He wasn't the best, he was by no means the worst. He seemed to enjoy it, but preferred being in goal and showed some bravery in throwing himself at the feet of groups of goal hangers that always materialise at that age. Then, not long after he had started they said that it was time to reduce a sports hall full of 5 year olds down to a squad for Under 7's football. The axe was to be wielded at reception class age. "If you signed up, you have to be committed. You have to turn up every week regardless." Woe betide those that don't. He wasn't going to make the cut and without the opportunity to continue training and learning we went elsewhere. This isn't some "Football is failing our youngsters" rant, everyone is different and has different life experiences. I know two friends who coach junior sides in Sheffield, I know the challenges they face, one blogs about the trial and tribulations of coaching here, but it has failed my boy. The junior football system didn't garner and develop the interest of young boys who might develop later as footballers. Cast aside at 6, because they aren't good enough and can no longer attend training because they are not in the squad. Teams are set up to compete and not develop, that means they don't coach and develop players who aren't in their squads. It is like Lord of the Flies, survival of the fittest. At the second local club we went to there was little attempt at integrating a new face. Other, clearly talented players laughed when he couldn't do what they could do, or when he stumbled and fall when taking a shot. The braying not picked up on by the coaches or the bullish and ignorant parents who think they have sired or given birth to the next David Beckham, complete with obligatory stupid haircut. We didn't go for many weeks. I love football. I enjoy playing - as well as I can - and will happily watch a match between anyone. But that environment wasn't a comfortable one to be stood in. I watched on with a huge amount of sadness. Would these things not happening have changed anything? Would he enjoy football now? Would he want to play with his friends at school? Would he find interest at Bramall Lane? Who knows, but I can't believe any of it has helped in anyway. Maybe my interest benefited from not going to watch United in the early to mid-80's when United stagnated, crowds dropped and frustration came to the fore. But I still enjoyed playing at school and after on the fields with mates or taking pot shots at my Dad in the back garden. I pored over Shoot! and Match magazines when they were delivered every week. Sunday mornings were reading the football reports and completing my League Ladders. He just hasn't got that interest. What he has got are other interests and other sports he enjoys and if they develop then that might mean over 25 years of being a season ticket holder for me come to an end. What he, or my daughter, wants to do comes first and I will support them and take them to wherever they need to be, when he needs to be there, to pursue what gives him happiness. That is what being a dad is about. He says he will still come to some games with me and I am probably a different fan when he is there with me; more tolerant of his day-dreaming and off-topic chats during the game, trying to give him more idea of what is going on, letting him do his own thing when he wants to. The club's marketing team have used the phrase "True Blades" are at the Lane. That might not always be the case. Sometimes, some things are more important than being at the football, however much I passionately support my team. There are times in the past where I had to be at every home game, be it the Zenith Data Systems Cup or a Testimonial. I went away to watch the Blades at 50/60 grounds. Little would deter me. Things change. Life changes. Fatherhood changes a lot. So if I am not there as often as I used to be, I am not less of a fan, I am just being more of a Dad. You never know, if I don't push it he might come back to football later in life………or maybe he won't. We shall see. Excellent blog and one I, and I'm sure many others, can relate to. As an ex-season ticket holder at The Lane with my eldest son, I think I was more disappointed than him when we decided not to renew due to other commitments. Don't get me wrong, he still enjoys going but also doesn't miss going, if that makes sense. As a grassroots coach (thanks for the mention), I can fully understand your comments regarding the junior football system and its failings. Grassroots should be for everyone, irrespective of ability. The team I run is very mixed and I had to make the decision to "cut" players due to league rules around only having so many in a squad and not having enough volunteers to help out with 15+ 10yr olds. There are clubs out there that do take it seriously, but there are many more that want to make it fun for everyone. In an ideal world, many of us coaches at grassroots would take as many kids as possible. As a dad, you want you're kids to enjoy the things that you enjoy, to share the emotions you go through. Sometimes though, we have to switch it round and enjoy the things that THEY enjoy. 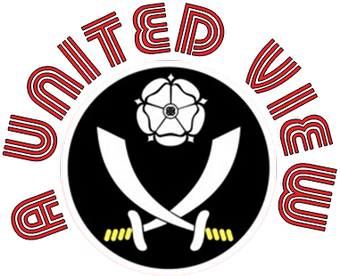 Really timely post for me, Ian... living Darn Saath opportunities to catch The Blades are limited and I'd love to take Big'Un (6) to Ashton Gate later this month. He plays football once a week at school, normally out on the wing... because that's where he can daydream the most! But he won't watch footie on TV with me and is worried he'll get bored watching a full match. That's before I factor in travel time, waiting for kick-off time... focus is not his strong point and he makes no secret about it! Hopefully one day I'll get him there, so that he can at least give it a go. Might be in just over a week's time, might be in his teens... but hopefully we'll get there (and with Young'Un, too). ...in England, it was SUFC-Bournemouth. Edwards scored. I think. ...in Italy, it was Genoa-Udinese (0-5). Zico's Serie A debut. He scored two amazing free kicks. I know. ...for now, I've bought us two tickets. If a £4 ticket goes unused, so be it. If a 6-yr old changes his mind at the last minute and Dad's not got him a ticket... that's not the regret I need. > as someone whose youth team won tons of trophies during his time there, even though I hardly ever got onto the bench (and never started a game in three -or was it five?- years), I concur! Spot on another great read, I have been going with my dad since I was 3 and like you it was the mid to late 80's when we were back on the up, my 1st daughter was born the week before webber scored v cardiff to send us up and her 1st game was blackburn at home the following season maybe a little too young at nearly 5 mths but have to start them young and over the years when the club did free season tickets for kids she has had one. Now nearly 8 she still come but like u have said I feel it is more for me and her grandad than wanting too. Really good post. I can relate to a lot of that. I go occasionally now with my dad and my two sons. We all have plenty of other things to do on a Saturday and the Blades have to compete now. My son No1 sounds a bit like your lad, He never really enjoyed kicking a ball as a toddler and has lost interest over the years after feeling rejected by primary and secondary levels. He now plays rugby and water polo quite well. With Son no.2 it's been very different. I held him back from a team as all I saw on Sundays was pretty poor competitive nonsense - nothing about skills and enjoyment. I took him along to Eddy Whytes Soccer Kids which runs out of Tapton School on a pay as you play basis on a Saturday morning. This has done wonders for him. The focus on proper skills and enjoyment rather than over zealous parents balling at their kids from the side is perfect. Mixed ability and enjoyment without any pressure sums it up. He now plays for a team and is actually quite good. The very competittive nature of the sport at that young age is still negative for me. The league fixation we have is stupid in my opinion. They don't do it in other (better) European countries - the emphasis is on skills development and teamwork. Also - my wife was telling me only yesterday about a friend's son who was told at primary school he wasn't good enough for the squad and so wasn't allowed to train with them either. Polite words escape me. Time to let Chris Morgan go?